Coconut Water Kefir – The Ultimate Probiotic Drink! Coconut Water Kefir is made from the water of young coconuts. It is a fermented beverage that helps hydrate you and cleanse your liver and intestines as well. It is an incredible probiotic that also has high amounts of vitamins, minerals, and electrolytes – just like plain coconut water. Coconut water kefir is great because it has lactobacillus and bifidobacteria, which help create intestinal flora — GOOD bacteria — and helps you digest food and produce and utilize more B-Vitamins in your system. 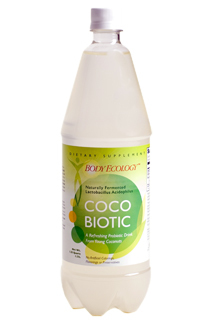 Cocobiotic is our featured Coconut Water Kefir product. As a refresher, the water from young coconuts has been found to contain the same electrolytes and pH level as human blood plasma, making it very healthy. The young coconuts have a green shell which would later on mature to the brown and hair coconut that you are familiar with. Clears the skin, creating a nice complexion. Clearing of brown liver spots has been reported, while tags, warts or moles have dried up and disappeared for some people. Have a strengthening effect on skin, nails and hair, causing them to have a healthy look. Eases PMS and helps restore the menses in women experiencing early menopause. First, lay your young coconut on its side. Cut several thin slices starting from the bottom side of the coconut. Do this severally until a brown ring appears. This ring signifies the soft spot. Use a large knife to puncture this soft spot. This is to create a hole in the coconut shell. Use a potato peeler to widen the size of the hole by rotating. Carefully pour the coconut water into a jug or bowl then strain into a sauce pan using a strainer or cheese cloth. Note: Pink coconut water indicates a spoiled coconut, so do not use it. 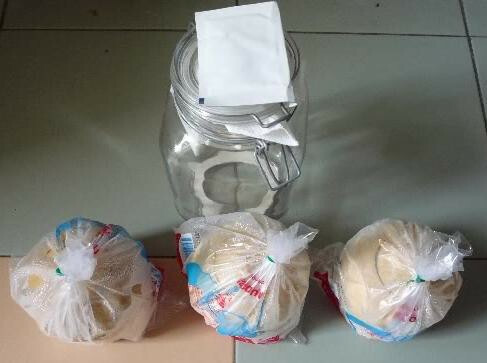 Heat the coconut water to 92 degrees F (31 or 32 degrees C) and immediately add kefir starter. Kefir starter is full of lactobacillus and yeast that is beneficial. Pour this mixture into a glass jar and then put a lid on it. Shake the jar the jar thoroughly and then place it in a warm dry place such as the kitchen pantry. It should be allowed to sit for at least 3 days (on fermentation, coconut water has a cloudy look and the color is lighter), after which you will shake it thoroughly again. Place the mixture in the refrigerator until it cools to extend its life or so as to enjoy the drink. Note: If you want coconut milk kefir, check out these milk kefir grains to get you started! Some enterprising people have brought the Tonix Coconut Water Kefir into the market, making it easier for more people to enjoy the benefits of the drink. It is packaged well and is easily available. Other than just taking the drink, you can use it on a coconut water kefir recipe. You can also use coconut water kefir grains to make more coconut water kefir. Can I order this on line – the “BodyEcology CocoBiotic? The list on this site is not allowing me to scroll down. If I can order on line – Please let me know the price and how to order. I was using this brand but had to travel about 40 mi ea way to buy it- can’t do that any longer so I am now taking another that I am buying from a Whole Foods store here in Asheville, NC. This store does not carry the BodyEcology CocoBiotic. I am not sure the brand I am currently buying is as good as the BodyEcol. I am about out – PLEASE let me know asap on where/how to purchase. Click on the image and it should send you to the store. This site is not a store, but we do use price comparison widgets for other stores..
can you use coconut water? I purchased from Whole Foods. I would like to know how to make RAW coconut water kefir…Or is that impossible? Here in Brisbane Australia the water Kefir multiplies crazily because of the heat. It just keeps doubling! I am experimenting with dried figs, lemon and lime slices and coconut water and local mineral water combined in the second ferment. Fizzy and interesting.